When your doors need protection from marring or damage our Diamond Aluminum Plate Kick Plates represent a great solution. Crafted from commercial grade solid diamond plate and fits all standard doors, while presenting an aesthetically cool rugged look. Helpful hint: Order your kick plate two inches shorter than the width of your door, so that it doesn't interfere with the door jamb when closing. We recommend Liquid Nails to create a strong bond for installing all Diamond Plate products. 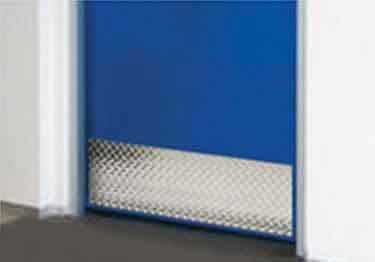 When your doors need protection from marring or damage our Diamond Plate Kick Plates represent a great solution. Crafted from commercial grade solid diamond plate. Fits all standard doors, while presenting an aesthetically cool rugged look. Thank you for your review and the time you took to give us your feedback. Your details explaining our great pricing and service is very much appreciated, let a lone the kind words about our sales associate. These kick plates were well made with the exception of the edges. They were not finished off so they were a bit sharp. Not that you are ever likely to come in contact with the edge once you mount them, but even so, it would be nice to have it smoothed. Otherwise they are nicely made. Pefect match for my decor. Adds a touch of class. Very good quality. Quick shipping. Good pricing. Price was right where I wanted it to be. Shipped very quickly. Quality was very strong and durable. Packaged very well. I have a new condo and I'm doing kind of a man cave thing in my garage. I had already put up diamond plate switch plate covers and my wife picked up a plain silver door kick plate. Wasn't to crazy about that and found your diamond plate on line. Love it and it really looks cool. I do however, have a recommendation. Please include installation instructions. I wasn't exactly sure how to install the kick plate, so went back on your web site. I noted that Liquid Nails was a recommended purchase so bought a tube. Wasn't sure how much to apply so I put it on sparingly. The plate required a second application to get it to adhere properly. It's on securely now and looks great.